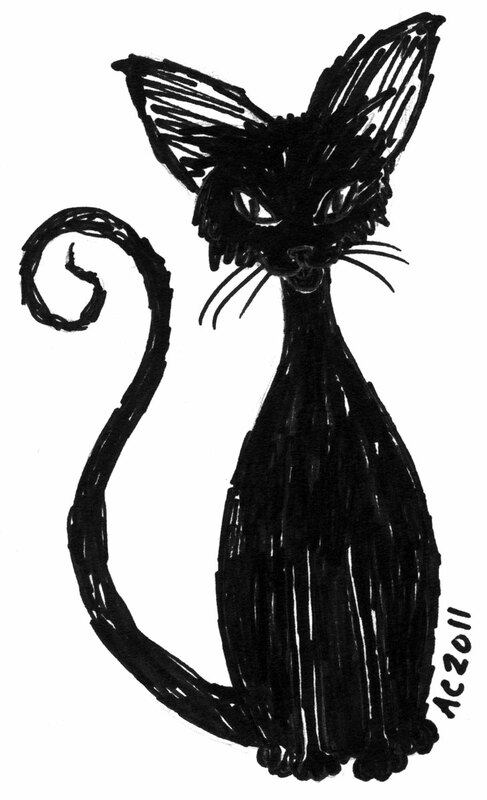 It’s Friday the 13th, so I thought I’d celebrate with a cartoon of my very own black cat. This doesn’t really look like him per se, but it shares some important features — big ears, wacky tail, and smirky face. His real name is Pod (short for Pteropodidae, the family name for fruit bats), but Poddleston is one of the many nicknames he goes by. I scribbled this up with Sharpie marker, while the real Pod was off somewhere making trouble. Or napping. Champion nappers, my cats. They could totally nap for nationals. KITTY!! Makes me ponder seeing if you’d do cartoons or sketches of my cats. Hm.